This short collection of twenty-two poems explores the duality of mind and body, separated and brought into conflict by physical illness. The poems are written with an expressive cathartic tone, a unique and wit-ridden perspective and a resilient refusal to be overcome. The free verse of these brief pieces slips subtly into the reader’s thoughts, alerting, informing and sharing: an injection, to borrow one of Hodgson’s metaphors. In some poems, like the carefully titled ‘Teenage/Ill, Ill/ teenage’, the poet confronts us with this dichotomy of existence – the two selves. Never shying from this, even the absence of line-ending punctuation causes the “ill me” to interrupt all the normal desires of a young woman. This dichotomy is introduced in the first, epithetical fragment that begins this collection. Posting this “caveat lector” ambiguously at the start, the poet warns that no ‘fairytale’ awaits inside and that themes of imprisonment and physical horror – represented by the skeleton – are likely. And indeed as the collection grows we must engage with discussions of gastric acid, subcutaneous injections, stitches, scabs and pus. Some fairytales are retold in the poem ‘Invisible’, in which the reader is instructed to ‘watch’, reinforcing a helpless distance between observer and sufferer, who is “ignored because / they are not beautiful”. This distance and isolation clings to any description of life in a wheelchair – compared to the “terms and conditions / no one reads” and ignored by a majority. “Accessible seating available” is a smart protest at the lip-service done to accessibility and deserves printing wherever a public building’s ramp is too narrow or uncared for. and it hasn't rained for years. are sick of their only taste (mint). This collection is more than a potsherd scraping sores. As the poet tweeted “There was a point where some family members thought I was being maudlin, but then they actually read some of my stuff and realised I was just pointing out how hard it is being ill/disabled!” Hodgson wrote her poetry pamphlet “exactly” because “we must remember not to forget ourselves”. 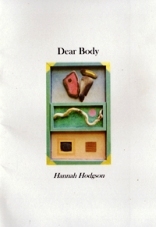 These vitally honest poems are like the “begging letters” written by her teenage self to her body. They express the poet’s frustration and desire for things to be otherwise – her pleading – her protestation and her resignation. But she re-enters the fray again and again, poetically and mentally. This is what the reader is called here to witness and to celebrate and it comes out most wittily and poignantly in the poem with which Hodgson finishes the collection. ‘Dear Body’ starts with a darkly humorous warning that she is tempted to hand her flesh “a redundancy notice” after all its failure to fulfill a role. But in the end she relents, sighs, and wills herself on.